ECOMAR GmbH presents another development in the field of small containerised plants called MINIPLANTS. The program offered comprises 2 types differing by the product: Block Ice or Chip Ice. All parts in contact with brine or water are of stainless steel, galvanised or effectively anti-corrosion treated. The brine bath is fully insulated and covered by removable panels. The ice-cans are of stainless steel. 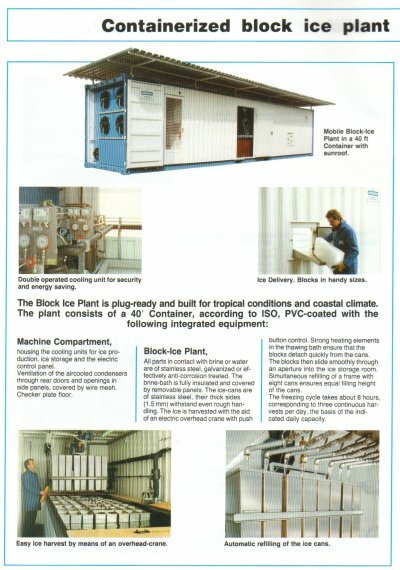 The ice is harvested with the aid of an electric overhead crane with push button control. Strong heating elements in the thawing bath ensure that the blocks detach quickly from the cans. The blocks then slide smoothly through an aperture into the ice storage room. The freezing cycle takes about 8 hours, corresponding to three continuous harvests per day, the basis of the indicated daily capacity. consisting of two separate units, each producing 50 % of the capacity (except for type 1500-C20). If full ice production is not required one unit may be switched off. If a defect occurs one side only will be affected with the other machine still producing 50 % of the total output scheduled. The freezing cylinder is surrounded by a cooling coil. Water feed from the water chamber into the cylinder where it is frozen on the inner wall. The ice is then removed from the cylinder wall by an auger, is pushed upwards, compacted, frozen further, then broken off and ejected. No moving parts which could cause refrigerant leakage are installed in the cooling circuit of the evaporators.